Stealing LIBERTY One Ploy At A Time! My Dad was working in Castro: Valley today and he saw what he called the “strangest thing” where “18-20 old people were standing on a street corner: taking turns to cross the street and pausing in the middle of the street”. : Always inquisitive,: he went into the corner: AMPM Market: to: inquire why: all the old people were there. The store attendant laughed and explained: to him: that the CHP was using them as bait to ticket drivers at that intersection. My: Dad of course walked outside and called the old people “thieves” but they didn’t have a clue. So did: a dozen and a half Castro Valley CHP Volunteers (old retired people with nothing better to do) stand on: a corner in Castro Valley today crossing from one side or the other targeting drivers who were in a rush to get to work? Or was my Dad just stretching a story out for me. Of course I went to the internet and I not only found the story in video… but the news reporter (whom I suspect set up the entire thing) sounded very jovial about the whole thing. Stanley Roberts of KRON 4 news said that: “in attempt to bring awareness to pedestrian safety, the CHP set up a sort of impromptu test for drivers”. Just as the old people were being deceitful in their roles as police bait, Mr. Roberts is downright lying by calling this an impromptu setup. News camera: + 18 aging volunteers to set up the drivers over and over is anything but impromptu. My Dad told me: that there have never been any incidents in those crosswalks, as related by the store attendant talking to him, the “reporter”. 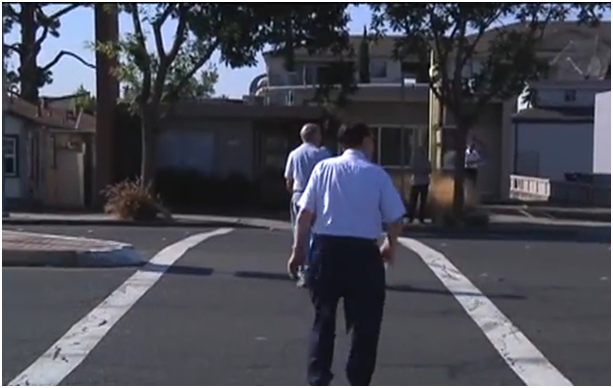 But Stan Roberts, “reporter”,: brought in a disabled man who had been injured in a crosswalk in another city,: Hayward, to “prove his point” about pedestrian safety. I’m all for pedestrian safety and obeying the law… you should see how I cross the road. Full of attitude and with the belief that if that car doesn’t stop they will be more damaged than I. All this got me to wondering though: Is this the “New America”, setting each other up and then being pleased as pie about it? Let me show you the real victims of government bullcrap like this, :55 into the video the “reporter” films a: workman in a truck: who begs the CHP not to ticket him as it will cost him not only the ticket but a $200 annual bonus for good drivers. Crosswalk fine at a few hundred bucks plus the bonus this guy will not be getting could break a typical American. What do you think? Please send your opinion to this jerk: reporter and creator of the program “People behaving badly”,: @KRON4SRoberts — the guy encourages people to behave badly toward their neighbor. If you are in the Castro Valley area and watch KRON News and know that Stan has knowingly set up other fabricated news stories, please let me know @TheRightMixx.